If you follow me on SnapChat (redalicerao) you already know that I am head over heels over Pixi Glow Tonic. I was even more ecstatic when I realized Cult Beauty ships to Pakistan so I can keep ordering myself instead of paying double the amount through Facebook Pages. 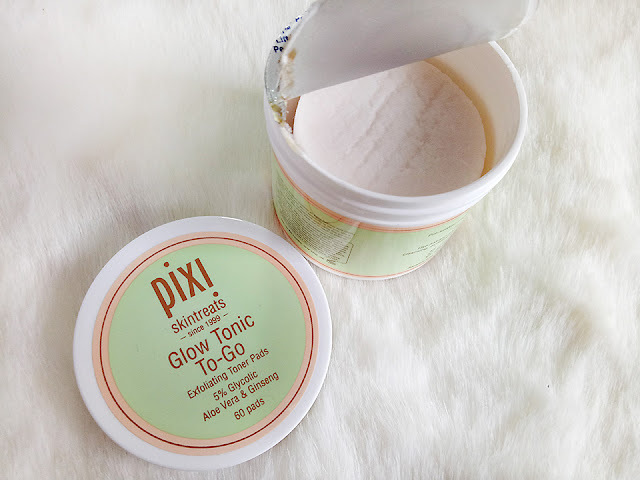 I recently got an even bigger surprise when Pixi Beauty sent me the Glow Tonic as well as the Glow Tonic to-go Pads and Glow Mud Cleanser. 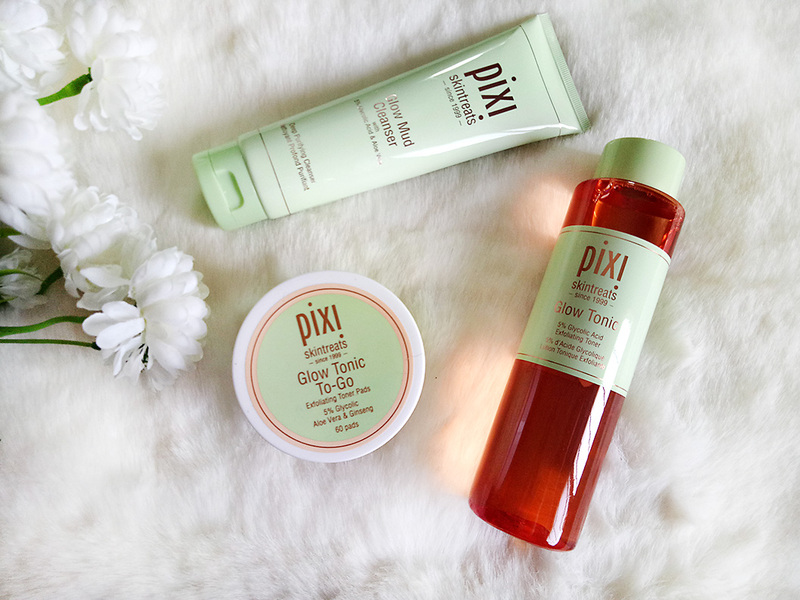 I tried these Pixi Skintreats and I love my skin even more now. I have gotten more and more serious about skin care in the past few years so have been trying a lot of skincare products as well. I have tested different products from Pixi Beauty as well, specially the skintreats and so far not been disappointed. 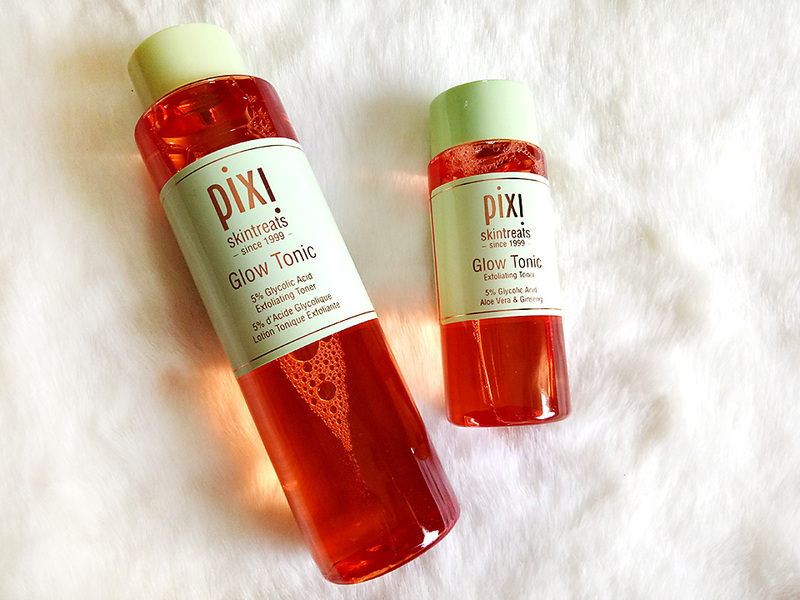 Pixi Glow Tonic is a lovely, gentle exfoliating toner that is perfect for everyday use. I am pretty sure that Pixi Glow Tonic has reach the cult level (unless it already has and I am clueless, fml). It is one of the best toners I have come across. How can it not be, just read the ingredient list and some of the best pop out; Aloe, Ginseng, Witch hazel, Glycolic Acid plus it has no alcohol so it doesn't dry out your skin. The Aloe soothes and hydrates, Ginseng is know for skin renewal and energizes your skin, Witch Hazel is a great healing agent, tightens skin and helps reduce sun damage, also on top of that it is great for fighting acne. The Glycolic Acid level is enough to exfoliate without being harsh on your skin. You will feel a tingly feeling but that is normal. All the ingredients present are good for all skin types (though I always recommend a patch test) and also have anti-ageing properties. Glycolic Acid is known to reduce wrinkles, dark spots and fine lines, hallelujah. The toner promises to tone, firm and tighten skin and reveal a healthier, glowing you. So far I have used it for two month and continuous use has improved my skin texture, made my skin look fresh and plump, tight and minimized pores. I may not be glowing like a 1000 watt bulb but I definitely feel my skin looks healthier, no dull moments. It didn't dry my skin and neither did it break me out. I have combination to oily skin and so far it has suited me, going well and strong. I use Pixi Glow Tonic twice a day, regularly, after I cleanse and before moisturizing. Simply saturate a cotton pad with the Glow Tonic and sweep across face, neck and décolletage (avoiding eye area). A skin wonder that helps smoother and firm as well as has anti ageing and anti acne properties, a must have for sure. 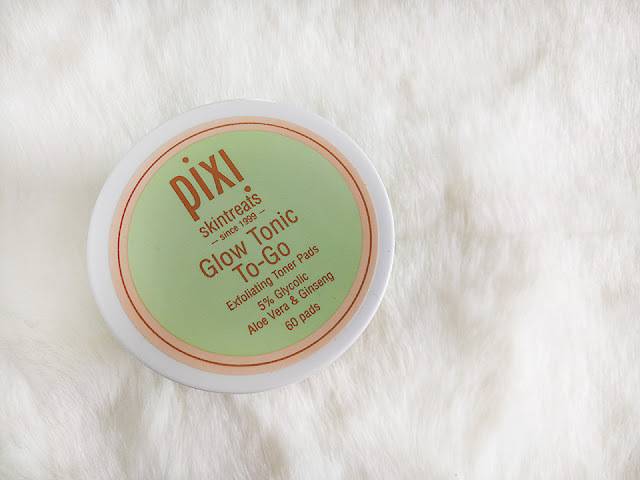 Good news for lazy girls, busy bees or travel bugs, who have minimum time to spare but want to still take care of their skin; Pixi Beauty has a pre-soaked version of the Pixi Glow tonic. It does the same thing as the Pixi Glow toner but is ready to be just picked up and used. I find these great for travelling. Honestly, I thought is was supposed to be some kind of mask, silly me, it does have mud but that just adds to the exfoliating properties. Now obviously it contains our favorite glycolic acid along with a delicious mix of mud and sugar cane extract, yaas! Even though it has a very muddy, paste like formula it is a cleaser and can be used alone or along with a foaming face wash. The thick cream like cleanser is not very gritty therefore the exfoliation is gentle and non abrasive. It contains nourishing oils, glycerin and aloe so it does not dry out skin. It is suitable for all skin types, but do check. My experience so far has been great. It does deep pore cleansing, exfoliates, leads to a smoother, brighter, happier skin. I use it for double cleansing as well at night. It applies as a paste and a pea size is enough. When you add water it emulsifies and washes away. If you have extremely oily skin you can follow with a gentle foam cleanser or just go directly to toning. Paring it with Glow Tonic leads to great results, of course. Guess what? I also apply is like a mask even though its not supposed to be used as one, but oh well. I apply it for five minutes so the Glycolic acid can do more magic and the other ingredients nourish the skin further, great idea that you can try as well and thank me! 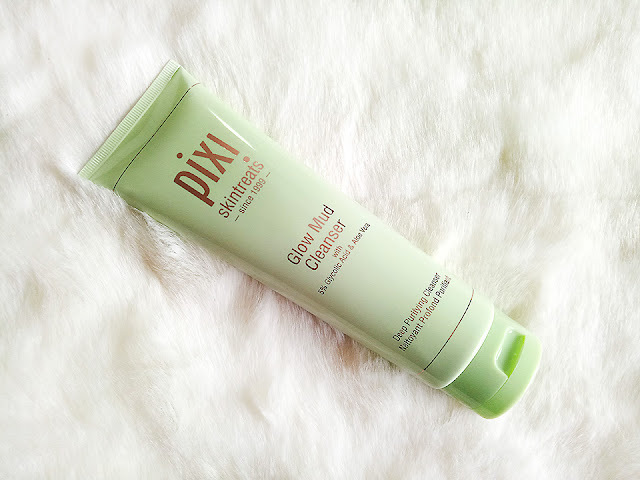 OVERALL, I find Pixi Beauty Skintreat products effective and affordable. I have a long list of things I am going to get from them. I reviewed their makeup as well before HERE. You can buy Pixi Beauty Products from their WEBSITE or even Cult Beauty WEBSITE. Cult Beauty ships worldwide and that is how I got one of my Glow tonic Bottles, yaay! IMPORTANT NOTE: You wont see results in a few days you have to use it for a week or two to actually see some difference. If you think that your skin will remain the same after you stop using this then you are mistaken. Skin products provide what your skin lacks, therefore, you need to keep using them regularly to give support. I am OBSESSED with the Glow tonic. I have the On the go pads and the mud mask too. Love PIXI Beauty. Their products are definitely a treat. Since my toner isn't working well... I guess I should give this a go! I looveee pixi!! I'm really tempted to try their skin polish and this cleanser too! Their cosmetics is good but their skincare is AMAZING you should definitely try! I love pixi products!! Will definitely try their glow tonic!! So happy to read this. Had been contemplating on getting the glow tonic but was confused how it would patch up with the rest of my new skin routine. Time to shop! I have heard so many great things about this range that I need to check it out. I need to try this brand! When ordering from cult beauty, does shipping into pakistan incur any extra charges or just the shipment charge that they list? Also, cult beauty website doesn't list Pakistan as a country that it ships to. Help! !